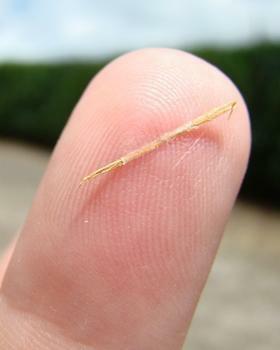 Though they may be small, splinters can produce a river of tears -- especially when the tweezers come out. To a child, the splinter removal process can feel like a specific brand of torture. And it’s just as difficult for the tweezer-wielding, splinter removal technician (we’ve all been there at some point). Thankfully, there are a few ways to take the tweezer out of the equation. Some say splinters can be removed by pouring a drop of household glue over the splinter, letting it dry, then peeling the dried glue off the skin. The splinter should stick to the glue when you peel it off. Another way to coax out a splinter is with a banana peel. Simply tape a piece of a banana peel to the splinter and leave it on for 5 to 10 minutes. From there, the enzymes in the peel will help dislodge the wood splinter. But sometimes, there’s no time to wait around for glue to dry or for banana peels to take effect. The tweezers will need to come out. Removing splinters as quickly as possible can help reduce pain and the possibility of infection, according to board-certified dermatologist Robert Sidbury, MD, MPH, FAAD, associate professor, department of pediatrics and division chief of dermatology, University of Washington School of Medicine. Wash and dry the area. Wash your hands, as well as the affected area, with soap and water before getting at the splinter and pat dry afterward. This can help prevent infection. Inspect the splinter. Construct a plan of attact by looking closely at the splinter to determine which direction it entered the skin. You may need a magnifying glass to see particularly small splinters. Use tweezers. Before you begin, sterilize the tip of the tweezers using rubbing alcohol. If part of the splinter is sticking out of the skin, use the tweezers to pull out the splinter in the same direction that it went in. Never squeeze out a splinter; Dr. Sidbury notes that doing so may cause the splinter to break into smaller, harder-to-remove pieces. Use a small needle. If the whole splinter is under the skin, you’ll need to enlist the help of a sterilized needle. Use the needle (and a magnifying glass) to pierce the skin at one end of the splinter and push out the splinter. Tweezers can be used to pull out the splinter once it's sticking out. Apply petroleum jelly. After the hard work is done, clean the area with soap and water and then apply petroleum jelly. Cover the area with a band-aid until it heals. Dr. Sidbury says that these at-home splinter removal tips are good for most splinters, but some splinters -- such as very large, deep splinters or those in or around your eye -- may require the assistance of a medical professional.